Known as the "Harbour City", it's no wonder that many visitors to Sydney want to stay near the harbour. The Darling Harbour is an area filled with entertainment and activities. It's just to the west of the Central Business District and there are plenty of trendy restaurants, boardwalks, aquariums, and attractions which you can easily walk to. Although there are many five star hotels around the harbour, there are also plenty of backpacker hostels available. Many offer a social setting where it's easy to meet other guests and make some new friends. This hostel is a good option for solo travellers, couples, and small or large groups. 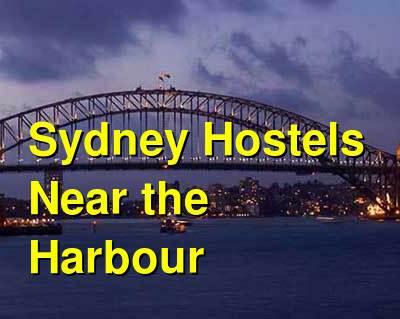 This hostel is a favorite among visitors to Sydney. It's in a great location where you can easily walk up to the Harbour Bridge Pylon lookout. It's also close to the Susannah Place Museum and the Museum of Contemporary Art. There are plenty of activities available to guests including pub tours and even a ghost tour. There's a range of room types available including double rooms and larger. Amenities include wi-fi, a full kitchen and barbecue area, a television room, laundry, storage areas, and travel information. The neighborhood is excellent and you can visit many of the local attractions including the Opera House and Circular Quay, local pubs, and the Dendy Cinemas. This hostel is a great option for solo travellers, couples, groups of friends, and female travellers. This hostel is small and personal with an excellent atmosphere. It's located near much of Sydney's best nightlife and is found on Mackleay Street near trendy cafes, bars and restaurants. You can easily reach Kings Cross' nightlife, but it is still far enough away that you can sleep well at night. It's in walking distance of some of the city's best attractions including the city center, the Opera House, the Harbor Bridge and much more. The service at this hostel is personalized and friendly. It's easy to meet other travelers and is safe and secure. It's a family owned and operated facility that has won several awards. Amenities include free internet and wi-fi, a Wii Game Station, DVDs, and much more. Guests have access to security lockers where they can safely store their valuables. This is a recommended hostel by many visitors to the area. This hostel is a great option for solo travellers, couples, and small groups. Although it's not a party hostel, it does have a social environment that is respectful of those trying to sleep. The Jolly Swagman Hostel has been around for over 15 years. It remains a favorite for travelers to the area, and is right in the heart of the city's backpacker mecca, Kings Cross. It offers excellent views of the city skyline and is surrounded by some of the area's best nightlife. You can easily walk to any club or pub you may want to visit and there are plenty of restaurants nearby. It's just a five minute walk from the Botanical Gardens and is a short distance from the Opera house and the Sydney Harbour Bridge. The hostel offers walking tours of the area. There's a social setting and it's easy to meet other travelers, even if you're traveling by yourself. Amenities include a full kitchen, television and entertainment area, a courtyard and free airport pickup. The staff is friendly and knowledgeable and the rates are fair. This is a great, centrally located hostel for visitors who are looking for a good time. This is a good hostel for solo travellers, young backpackers, and small groups of friends. This hostel is beautifully situated in a Victorian mansion that has been fully restored. It has a great reputation as a friendly and welcoming hostel with a social atmosphere. Amenities include free wi-fi, an outdoor courtyard, a full kitchen, an entertainment room, luggage storage, lockers, and laundry facilities. A range of rooms are available including doubles, twins, and singles, and you can choose between private and shared bathrooms. Dorms are also available in sizes ranging from 4 beds to 10 beds. The hostel is in a quiet area that is just 200 meters from Kings Cross station. You can easily walk to the Harbour Bridge, the Opera House and The Rocks.